Depth is very important in fantasy football. We know all too well that injuries can happen at any time. You can’t predict them. And sometimes, those injuries can absolutely decimate our fantasy teams. While depth isn’t going to prevent injuries, it will at least help you roll with the punches down the stretch. Over the last few days, I’ve received a bunch of questions from folks asking if they should trade away running backs to get other positions in return. Almost every time, my response has been “nope, keep your depth at running back.” Even if you think you’re loaded at the position, you can never have enough depth. Two running backs aren’t enough. Three running backs aren’t enough. If you really want to roll into the fantasy playoffs with enough ammunition to take your league by storm, you need at least four running backs. And I’m not talking about fringe guys with upside like the Josh Adams types of the work. I mean legitimate top-20 guys who can start for your team every week. Sure, you aren’t going to use all four each week. But if disaster strikes and one of your starters goes down, you’ll be able to move the next man up right into your starting lineup without skipping a beat. You simply won’t be able to do that with a running back off of waivers. Better yet, those running backs you don’t trade away can’t be used against you in the fantasy playoffs. It’s a win-win situation that will go a long way in helping you win your league. Todd Gurley has been absolutely incredible this season, but he isn’t the league’s No. 1 fantasy scorer over the last month. That distinction goes to Kareem Hunt. The Chiefs back leads all running backs with eight touchdowns over that span, which is one more than Gurley. With the Kansas City offense rolling, Hunt is set up for continued success going forward. We finally saw Dalvin Cook return to the field last week, and he looked like his old self with 10 carries for 89 yards. Cook surprisingly out-snapped Latavius Murray 25-22. The Vikings are on bye this week, but look for them to unleash Cook when they return. He’s shaping up to be a fantasy difference make for the stretch run. 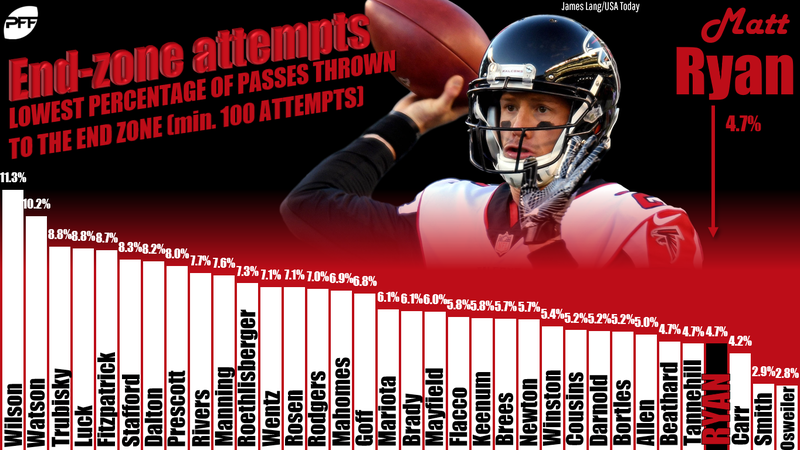 Matt Ryan was one of the top fantasy quarterbacks last week thanks to his four touchdown passes. But the credit really goes to his receivers. Ryan notched these four scores despite throwing zero balls to the end zone, which means his receivers did a lot of the work after the catch. People are quick to point out Julio Jones’ lack of work in the red zone, but Jones isn’t the issue here. Ryan has just 14 end-zone throws on the season, which is just under half what league-leader Andrew Luck has put up so far. Ryan ranks a lowly 25th in this category. So while last week’s numbers certainly look good, Ryan really needs to look to the end zone more often if we’re going to rely on him as a consistent fantasy producer. Speaking of red-zone throws, Russell Wilson has been on a tear. He threw another four balls to the end zone last week, giving him a total of 15 over his last three contests. While the Seahawks have been very run-heavy, Wilson’s eyes for the end zone makes him very appealing for the fantasy stretch run. The Patriots look like they could get Sony Michel back this week. 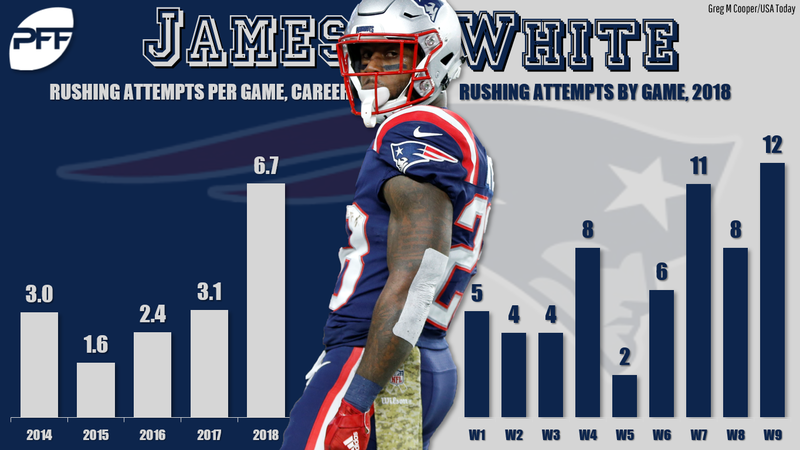 The rookie runner has been sidelined the last two games, and New England has turned to a backfield combination of James White and Cordarrelle Patterson. White has been fantastic all season as a receiver but was also used somewhat heavily as a runner last week with four goal-line carries. White will still have fringe RB1 value with Michel back, but expect most of the carries to shift back to Michel. Fantasy owners should view Michel as an RB2 play if he returns. There’s also a lot of buzz about Rex Burkhead returning to practice. While some have recommended running out and picking up Burkhead, that may not be the best use of your bench for the fantasy stretch run. At best, Burkhead will get worked in along with Michel and White. At worst, he’ll get injured again. As his history has shown us, Burkhead is far from durable. Randall Cobb got a mid-week downgrade with a limited session on Thursday. While this could be a veteran getting rest, downgrades are often a bad sign. Rookie Marquez Valdes-Scantling is already moving into a more prominent role in the Packers offense with Geronimo Allison being place on injured reserve, and he could see an even larger target share if Cobb ends up sidelined. A foot injury has kept Sammy Watkins on the sideline this week, and he now looks to be on the wrong side of questionable. This is a bit concerning given Watkins injury history with his foot, so hopefully it doesn’t turn into something that lingers over the long term. In the meantime, plan to be without Watkins this week. The Saints placed Cameron Meredith on injured reserved less than 24 hours after signing Dez Bryant. While Bryant doesn’t have major appeal, a quick look at the Saints depth chart suggest that he’s going to be heavily involved immediately. Right now, the Saints have just Michael Thomas, Tre’Quan Smith, and Austin Carr to go along with Bryant. Just when it looked like Darren Sproles was going to get back on the field, the veteran suffered a setback. Sproles will miss this week, leaving the Eagles with Wendell Smallwood and Corey Clement to handle passing down work. However, you can expect to see Josh Adams to continue to get more involved on early downs. He’s an intriguing add in deep leagues. Other injury notes: Adrian Peterson will be good to go for the Redskins this weekend. But the bigger concern here is a Washington offensive line that will be without three of its five starting linemen. … The Redskins will also be without Chris Thompson, who is dealing with a ribs injury. Kapri Bibbs will again operate as the primary change-of-pace back. … The frustrations continue for Rob Gronkowski owners, as the veteran remained limited on Thursday. His Week 10 status is still very much up in the air. … Keep an eye on Marlon Mack’s Friday status. He’s been limited so far this week and should be good to go. However, a Friday downgrade would bode poorly. … The Jets will be without rookie QB Sam Darnold, who is dealing with a foot injury. Josh McCown will get the start this week. … Allen Robinson looks like he’ll be back on the field for the Bears this week. However, his matchup could be a little tricky. We expect him to see a shadow from Darius Slay. The Bengals will be without A.J. Green this week, so look for Andy Dalton to lean on Tyler Boyd. Extra volume bodes well for Boyd this week, as does his matchup. Boyd will spend a good chunk of the day in P.J. Williams’ coverage. While Williams did win defensive player of the week two weeks ago, he’s been one of the league’s worst corners in coverage with a 72% catch rate and 5 touchdowns surrendered this season. On the other side of that contest, there’s a lot to like about Michael Thomas this week. Not only are the Saints uber thin at wide receiver, but he also gets a plus matchup against a Bengals defense that is allowing 319 passing yards per game. Thomas will draw primary coverage from William Jackson. The Bengals corner struggled against the Bucs in Week 8, allowing four catches on eight targets for 119 yards and a touchdown. Amari Cooper got in the end zone in his Cowboys debut and makes for a solid play this week against the Eagles. He’ll see a combination of Ronald Darby and Jalen Mills in coverage — if Mills plays, which is looking increasingly unlikely. The Philly duo have seen a combined 114 targets thrown into their coverage over their first eight games this season. Darby is tied for the league lead in receptions allowed (39) and Mills ranks fourth in yards surrendered (516). If Mills sits, the situation becomes even better. Fantasy momentum is building for Josh Gordon, and that’s likely to continue this week. Gordon will see plenty of coverage from former Patriot Malcolm Butler. On the season, Butler leads all corners in yards allowed (618) and touchdowns surrendered (7). Needless to say, those are two categories you don’t want to be leading at Butler’s position. Tyler Lockett has quietly put together a top-20 fantasy campaign over the first half of the season. Lockett is poised for a big game against the Rams this week. Marcus Peters hasn’t been as billed this season. In fact, he’s been a major liability in coverage with an average of 17.4 yards per catch surrendered this season. 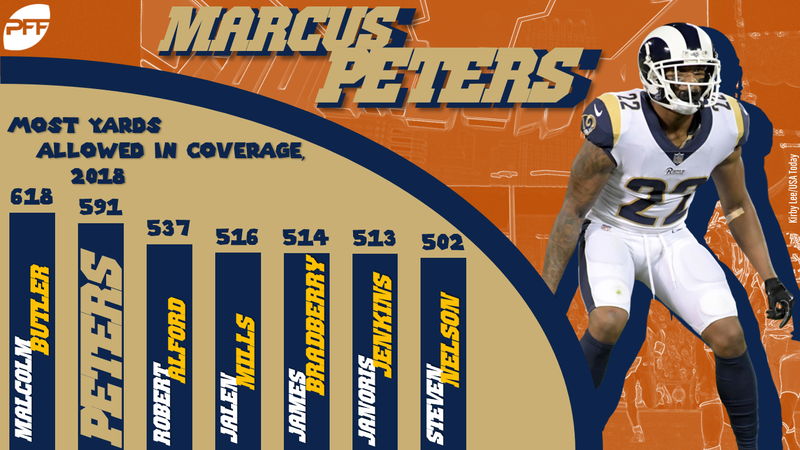 Opposing receivers have racked up 295 yards in Peters coverage over that last two weeks alone. It’s been an up and down season for Corey Davis, but his arrow is pointing up somewhat after a solid performance against the Cowboys on Monday night. However, fantasy owners may want to look to fade Davis this week. We expect him to see a shadow from Stephon Gilmore, who has been very good this season. Gilmore is currently allowing the lowest catch rate in the league. The Colts return from bye this week, but it’s tough to be too confident about T.Y. Hilton’s matchup against the Jaguars. Hilton is a good bet to see a shadow from Jalen Ramsey in this contest. While Ramsey doesn’t currently grade out among the league’s elite corners, he’s done a very good job of keeping opposing No. 1 receivers in check in shadow coverage. Hilton offers plenty of upside down the stretch, but don’t be surprised if he struggles this week. With Sammy Watkins banged up, Tyreek Hill could draw his share of Patrick Peterson. While he hasn’t been a true shadow this season, Peterson has started to track receivers on the outside. Among corners who have played at least 80% of their team’s snaps, Peterson has seen the third-fewest balls thrown into his coverage this season with just 31 targets. It could be a quiet day for Hill. Last week was ugly for the Detroit passing game, and their outlook doesn’t look any brighter this week. The Bears look like they’ll get Khalil Mack back, which means Matthew Stafford could again have minimal time to throw. Add to that the strong play of the Chicago secondary, and both Kenny Golladay and Marvin Jones are looking at a slight downgrade this week. Golladay and Jones will see Prince Amukamara and Kyle Fuller in coverage. Amukamara is allowing an impressive 54% catch rate, and Fuller is right there with 56%. Both are among the league’s best in that category. It may not be the most favorable gamescript for the Cardinals this week, but it’s hard not to like David Johnson as an RB1 play against the Chiefs. Kansas City allows the most fantasy points per game to running backs with an average of 5.2 yards per carry surrendered to the position. The Chiefs are also giving up the third-most receptions per game (6.7) to running backs in 2018. Of course, Kareem Hunt also gets an upgrade on the other side of this contest. He’s been excellent over the last month and will continue to roll this week. The Cardinals have allowed 10 rushing scores to running backs with opposing backfields topping 100 rushing yards in 6-of-8 contests against the Cardinals. Isaiah Crowell wasn’t able to get it done against Miami last week, but don’t let that dissuade you from starting Aaron Jones this week. The Dolphins are currently the No. 3 PPR matchup for running backs with backfields reaching pay dirt in 6-of-9 games. Jones is a rock solid RB2 play this week. Speaking of touchdowns, Tevin Coleman scored two of them last week. He’s a good bet to find the end zone again this week in a plus matchup against the Browns. Over their last four games, Cleveland has allowed a massive eight rushing scores to running backs. This also bodes well for Ito Smith, who scored a rushing touchdown last week. There’s only one team in the NFL that has not allowed a rushing touchdown to a running back this season: the Bears. That’s bad news if you’re looking for a big week from Kerryon Johnson. Detroit has shown that they are going to continue to feed Johnson the rock. But there’s a good chance he’ll have limited room to operate in this contest. He’s still in RB2 territory, but don’t freak out if it isn’t a big week for Johnson. Tough sledding could be ahead for Ezekiel Elliott, as the Cowboys have to face a very tough Eagles run defense this week. On the season, Philly has allowed just one backfield to top 100 rushing yards and have only surrendered two combined touchdowns to the position. Of course, if you own Elliott, you have to start him. But just like with Johnson, don’t panic if it isn’t a big week. Like Elliott, you very likely are in a position where you have to start Andrew Luck. His matchup against the Jags likely doesn’t instill much confidence in his fantasy owners. The Jags are the fifth-worst fantasy matchup for quarterbacks this season. However, there is a sliver of hope. Jacksonville will again be without CB A.J. Bouye. He was also sidelined when we last saw Jacksonville, and Carson Wentz managed to put up three passing scores in that contest. We faded Philip Rivers last week, but he’s back in our fantasy good graces with a plus matchup on tap against the Raiders. Oakland has allowed at least two passing scores to seven of the eight quarterbacks they’ve faced this season with three passing scores surrendered in each of their last three games.